fRoots | . astrakan project . We feel very honored to be among all these talented artists. And it gives extra value to these months/year of deep and profound search around music and sound. And also it cheers us up as we are just back from almost a week of radio promo in Brittany. We did very nice interview, met very nice people too, and let’s be honest, it always feels good to talk about this very personal projet. So, why? Why do we need to be cheered up? Well, despite of dedicated promo work, and having the chance to be welcomed by most of Breton radios, it hasn’t really translated into sales. Not sales from Brittany at least. And of course, yes, we’d love to also have some more folks enjoying and supporting our music over here. After all it’s Breton music right? Also, every single sale pushes the day we’ll have to go back to employee job a bit further away, and everyday staying focussed on our music and art is to be enjoyed and made great use of! yeah! We’re in fRoots magazine! We’ve been hardly focusing on music recently, due to all the events that are happening right now in Turkey. We’ll try to tell you soon a few personal feelings from “the inside”. 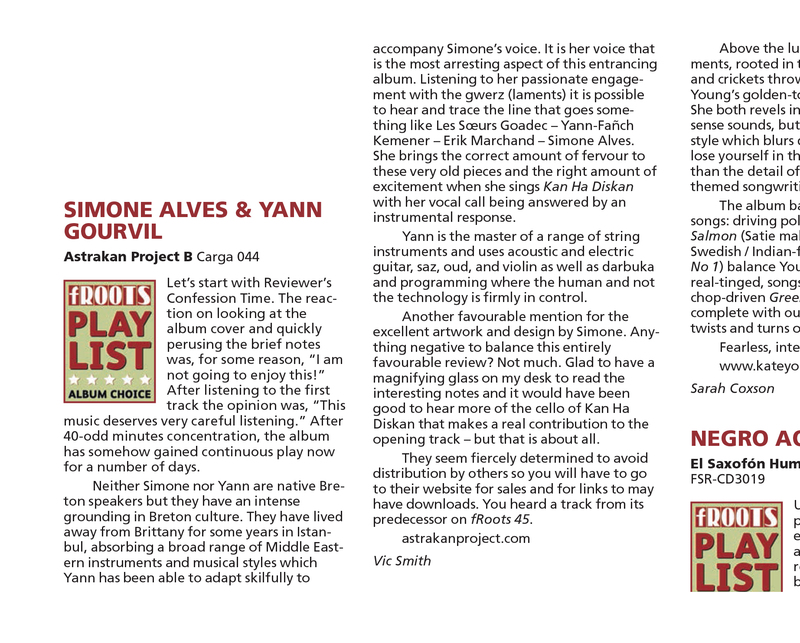 In the meantime, we are proud, really really proud to read this review about our album in fRoots current issue. Sometimes I get hoist by my own prejudices and preconceived ideas. So it was that I glanced at the back of this album, noted the legend “A colourful and delicate oriental shine over wild Celtic music”, and the dread vision of Loreeena Newage materialised. And so it festered unplayed in the ‘oh f*** do I really have to listen to this?’ pile on my desk for several weeks, until we were just about to go press with this issue. Don’t do that at home. Should a copy of this CD appear in your letterbox, hopefully because this review may have alerted you to it, seize it and put it in your player straight away. You will not be disappointed. For ‘Celtic’, do not read ‘wifty-wafty-synthy-twee’, but instead gloriously full-throated, truly inspiring Breton singing and melodies from Simone Alves. For ‘a colourful and delicate oriental shine’, read ‘roaring, intricate, fiery, imaginative accompaniments’ from multi-instrumentalist Yann Gourvil on oud, electric saz (or baglama as the Turks call it), violin and programmed percussion. Indeed, for ‘oriental’, don’t read ‘Far East’ as we Brits tend to use it, but ‘from the Eastern reaches of the Mediterranean’. It’s the sort of production that wouldn’t sound out of place on the better contemporary Turkish roots records – it turns out that they’ve lived and studied in Istanbul for the past few years – and it’s obviously a close relative to what Kristi Stassinopoulou & Stathis Kalyviotis did with Greekadelia. In fact I’d christen it Breton-Turkadelia if I hadn’t run out of credit in the ‘name a genre a day’ fund. When I hit them up for a copy of the biog that this maltreated review copy had obviously got separated from, I found that they were involved in one of the sainted Erik Marchand’s inspiring projects that included Ross Daly, Thierry ‘Titi’ Robin and Keyvan Chemirani. That makes complete sense, and they are justifiably spoken of in the same breath as those iconic names. And if that doesn’t get you people who know about that sort of thing reaching for your credit cards, I don’t know what will. A truly fabulous, spirit-raising album. Really, if you hadn’t heard about our music already, doesn’t it feel like you would love to straight away?